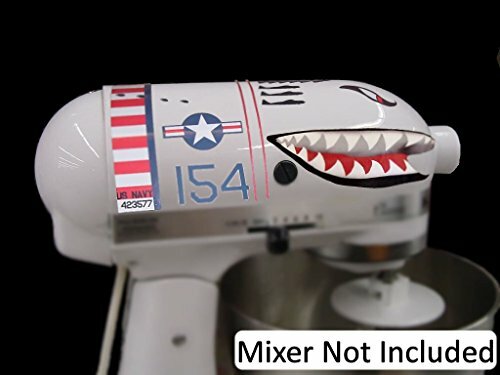 With this Shark Plane on your mixer, it gets tons of attention like your mixer should! Notice the nice color bleed, the pin stripping, and smell of envy it creates! Actual color bleeds and pin striping will be similar, but each is one of a kind due to printing variations. This vinyl is meant to last 5 years outdoors(!) so it will last in your kitchen as long as your mixer does. Basic installation instructions, cleaning pad, and trouble shooting guide included FREE with order. Please do not use harsh chemicals like 409 as it may damage the graphics. For added protection a layer of shellac (which is always food grade) is acceptable. Clean, mark the location, Take off the sticky paper, press the sticker on your mixer, remove the protective top paper. Anyone can do it and it makes a Great Gift! The kit will not interfere with your accessories, the Pasta Roller Maker (PRA), Food Grinder (FGA), Juicer, Can Opener, Ice Cream Maker, Sausage Stuffer, Slicer Shredder (RVSA), Grain Mill, extra bowl, or pouring shield. The decal will look great on your color; Empire Red, Orange, yellow, blue, white, black, grey, brass, bronze, cobalt blue steel, Cinnamon, copper, licorice, pewter, meringue, nickel, pearl metallic, cayenne, sage, onyx black. Note also if you send your mixer back to KitchenAid under warranty, so go your flames. 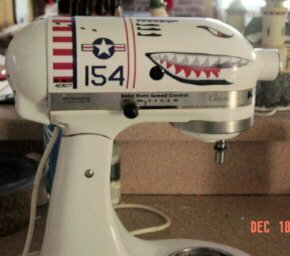 This product is has no affiliation or endorsement by KitchenAid. 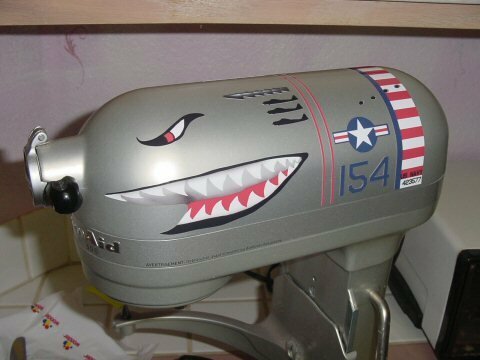 The decal manufacturer is a third party vendor who likes and uses KitchenAid products but improves on their color scheme. 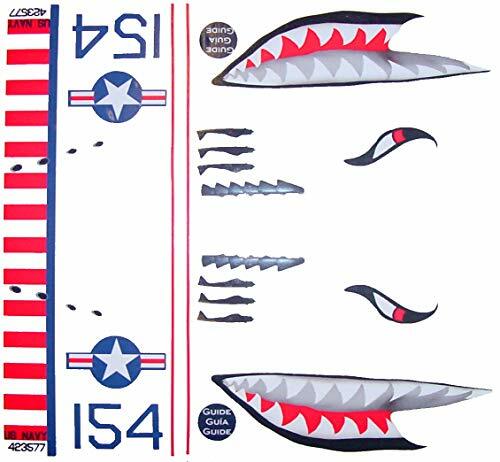 *******Product includes the 1 large sized decal kits, instructions, and cleaning pad. Inspired by the Flying Tigers, this is a Navy Shark plane from 1942 with exhaust, bullet holes, squadron stripes, pilot ID 154, and 3 Zero planes downed. BEWARE of CHEAP Imitations. This is Five year outdoor color durability ink process on 5 mil thick (0.005") high quality vinyl and a Scrubbable overlay protection. If you have any questions about this product by FlameKA.com, contact us by completing and submitting the form below. If you are looking for a specif part number, please include it with your message.